This shell tube condenser is a device or unit used to condense a substance from its gaseous to its liquid state, by cooling it. In so doing, the latent heat is given up by the substance, and will transfer to the condenser coolant. Condensers are typically heat exchangers which have various designs and come in many sizes ranging from rather small to very large industrial-scale units used in plant processes. 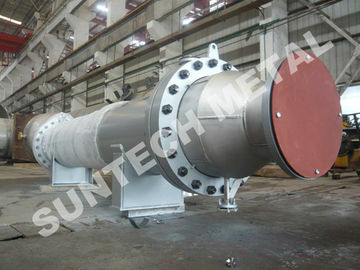 Shell and tube type water-cooling condenser is applicable to water units, water source heat pump units, etc. Suitable refrigerants of R22, everything,, R407C, R410A, etc. Apply load cold agent for tap water, underground water, river water and sea water or brine, water and glycol solution, sulfate solution, etc. For heat exchange tube, copper pipe, copper nickel alloy tube, aluminum brass tube, stainless steel tube, etc. Shell using seamless steel pipe, stainless steel tube, etc.